We hope you and your family enjoyed a very Merry Christmas! Our plan to drive home in two shots and arrive Saturday drastically changed. We hit the road from Provo about 11:30 am PST on Friday and drove the whole way! We arrived home about 11:30 pm. My major concern is always how Colleen is doing, as her joints can’t take long travel as they once did, due to the lupus she deals with. We stopped every couple hours for some stretching and she seemed to do well. Even now, a few days later, she has fared well. Sometimes, the soreness doesn’t hit until a day or two later. The last week or so has been fairly schedule intense for us. There were a few meetings with the school district, his new school in Camarillo and the county in-home services team that will walk with us through the transition. All to prepare for Jonathan’s return home. Colleen’s schedule had been pretty busy. She navigated teaching a second class this semester in Oxnard. She graduated that class last week and won’t be continuing the job there. Then there was this thing called Christmas. There were a “few” things to try and prepare for that. My favorite holiday personally. 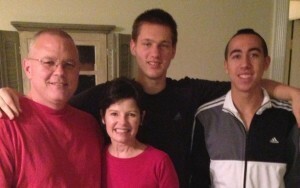 Then the trip to Provo, Jonathan’s graduation (very emotional for us), and the trip home. Did I forget to mention that I work a full time job as a Pastor too? Oh, that’s right! Home late Friday night, up Saturday to spend the day writing the message that had been ruminating in my heart all week. Sunday, that message seemed to be the right one for the day and season. The afternoon rolled out with errands for Christmas prep. Monday held the requisite and regular weekly grocery shopping and then prep for Christmas Eve Celebration at church at 5:30 pm, which went off without a hitch to a packed house of regulars and new folks, and even a number of people we hadn’t seen in a long time. After finishing that and wrapping a couple of final presents, we headed to a Christmas Eve Party with parents of one of Josh’s friends that we hadn’t had a chance to meet yet. That turned into a great time! Once we arrived home from there, we had our traditional opening of one gift. LOTS of fun with this, especially for Colleen and I to see the excitement there was in Jonathan. We know it’s early in the transition. We’re not declaring huge transformation (there is a good amount), but in his excitement, we both felt we saw the son we had been missing for years. There is a child-like part of him that came out the last few days that we weren’t sure we would ever see again. It has been glorious for us. I know that’s quite a word, but it fits what’s in my heart. We had the house filled today with family and friends. My parents, sister & bro-in-law, Colleen’s sister & her two kids, Colleen’s grandfather and later on a friend from church with her two kids. My dad made the turkey. I’m the carver of the family. I’m usually carving meat from the bones. This one was so moist I was literally pulling the bones out of the meat! Never seen a turkey like this before! However, I’m going to have to talk to my dad about what he did with that turkey. I’ve heard of turkey comas, tryptophan comas and the like. I’ve even experienced them. But NOTHING like the drowsiness that hit me after this meal! I was in and out of it for a few hours. Jonathan would try to talk to me every once in a while, but it was no use. When I finally woke, I felt like I’d slept for days! With that, it’s time to sign off. Lots to do tomorrow to help Jonathan complete his Christmas. Forget the “turkey coma,” you were just plain tired! I got tired reading about all you did. But it’s part of the fun, isn’t it? Rest up, pastor. See you Sunday.